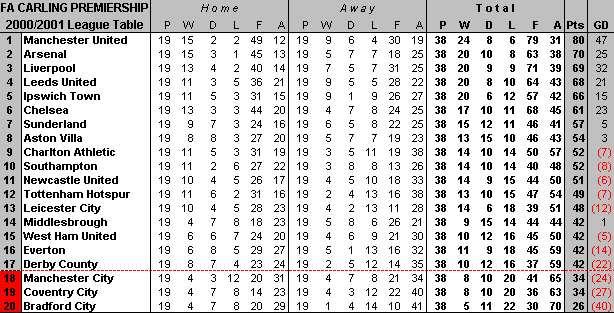 Manchester United won the league for the third time in succession with Arsenal way behind them. Leeds United went for broke with a huge bank loan on the condition they made the Champions League but Liverpool got the place by one solitary point. Ipswich Town caused a shock by finishing 5th and getting into the Uefa Cup first round in there first season in the Premier League. Only the top three lost less than Aston Villa this season but because of there record 15 draws could only manage 8th place. Newcastle with a £21m strike team (Shearer and Carl Cort) could only manage 11th but both Villa and Newcastle get into the intertoto cup for a chance to get into the Uefa Cup. Manchester City, Coventry City and Bradford City all got relegated from the Premier League to be replaced by Fulham, Bolton and Blackburn Rovers. We are going to take a look at five clubs who had good season's or season's that they would want to forget. Another season of decent (but rarely exciting) form saw Villa secure another top-10 finish, though this time they dipped slightly into eighth place after occupying sixth place a year earlier. Villa proved themselves as one of the hardest Premier League teams to beat, with only the top three sides suffering fewer defeats than Villa's 10. But a mere 13 wins and a staggering 15 draws ended any hopes of a title bid or even a top-six finish. The arrival of Yugoslav striker Boško Balaban at the end of the season gave fans renewed hope that next season might deliver more success. Tipped by many to go straight back down to Division One after winning promotion, Ipswich surprised observers by consistently holding a place among the top six. For much of the season, it looked like they would finish in the top three and qualify for the European Cup for the first time in nearly 40 years. In the end, they finished fifth and qualified for the UEFA Cup for the first time since 1982. Manager George Burley was then voted "Manager of the Year" by his colleagues. David O'Leary took Leeds to their first European Cup semi-final since 1975, where defeat at the hands of Valencia ended their chances of a repeat of the ill-tempered 1975 European Cup clash with Bayern Munich who beat Real Madrid in the other semi-final. The club's league form in the first half of the season had been dire, and they had been as low as 14th place at Christmas. However, after a dramatic improvement in form they finished fourth in the final table, which meant that their place in Europe for 2001–02 would be in the UEFA Cup rather than the European Cup. Failure to qualify for the following season's Champions League was considered a disappointment rather than a disaster by fans of the club at the time, given the success in reaching the semi-final. However, the directors of the club had secured tens of millions of pounds of loans which depended on successful Champions League qualification, so it will be very interesting to see how it plays out from here. The first trophy was secured on 25 February when a 5–4 penalty shoot-out victory followed a 1–1 draw with Birmingham City in the Worthington Cup final. The game was also the first club fixture to be played at Cardiff's Millennium Stadium while Wembley was being rebuilt. Part two of the treble was completed on 12 May when two late Michael Owen goals overturned Arsenal's lead in the FA Cup Final to give the Reds a 2–1 win. The final part of the treble was perhaps the most dramatic. The UEFA Cup final featured an amazing 9 goals as Alaves gave them a run for their money fighting back to equalise from 1–0, 3–1 and 4–3, before Liverpool finally ran out 5–4 winners after extra-time. Promising young midfielder Steven Gerrard was voted PFA Young Player of the Year for his key part in one of the most successful seasons in Liverpool's 109-year history, and contributions from British stars Michael Owen, Robbie Fowler, Jamie Carragher, Danny Murphy, and new signings Gary McAllister and Emile Heskey were matched by an increasingly continental side consisting of new captain Sami Hyypiä, Sander Westerveld, Jari Litmanen and Dietmar Hamann. Southampton enjoyed their best form in several years after it was announced that Glenn Hoddle was replacing Dave Jones as manager on a permanent basis. But Hoddle caused outrage by walking out on the Saints in late March and taking the managerial vacancy at Tottenham the next day. Coach Stuart Gray took over on a temporary basis, and with Southampton's good form continuing he was rewarded with the job on a permanent basis. Southampton's best moment was an 89th-minute winner by Matthew Le Tissier to pull back from 2–0 down against runners-up Arsenal. 2000–01 was Southampton's final season at the Dell. After 103 years, they move on to the St Mary's Stadium on Brittania Road, which with 32,000 seats is more than twice the size of their old ground and is seen by many as the way forward for a club. You are reading "Championship Manager 2001/2002: Changing The Ways: The Unexpected Chance".